Born February 3, 1949 to John and Katherine (Smith) Nelson in Louisville, Kentucky. Died November 22, 2018 at Harborview Medical Center in Seattle, Washington. 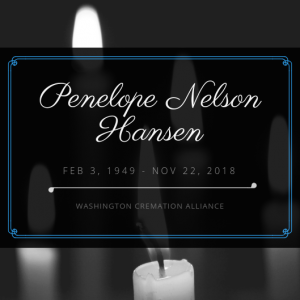 Arrangements by Washington Cremation Alliance – (206) 745-0900.